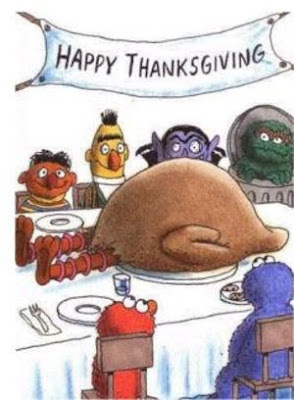 So, even though we're technically in the future compared to North America, I thought I'd take this opportunity to wish everyone who lives in America an early Happy Thanksgiving. Here in the world outside of the mighty-economic-powerhouse that is the USA, we don't necessarily celebrate the same holidays that you do. However, seeing as how the rest of the world seems to think that the mighty USA is the "defacto" promised land, we have to learn about all of the American holidays as if they're our own. So here in Korea, even though we've had a better, longer, more delicious, five-days-off holiday called Chuseok, we get to spend two weeks talking about Thanksgiving, the Mayflower, and the good old "Indians" who helped the poor Pilgrims survive. I politely offered to add the aspect of cannibalism to our lesson as an additional struggle that the Pilgrims had to resort to in order to survive...they white-blanchadly replied "no thanks". This past week I have been conducting speaking tests with my students. Typically, I'll give the students a list of possible questions that I "might" ask them -so they have a rough idea. Some of the students prepare ahead and try to memorize, but usually I'll ask them one question, and create more questions based off of the one they just answered. I'll grade them on their pronunciation and and grammar inside their sentence. So far, I've had three straight days of nothing but speaking tests, and some of their answers have been quite comical - I'll do you a service by letting you know some of the best answers to the five different questions. Mind you, as these are not direct quotes, I've improved the grammar, so you can make sense of what they're saying -trust me, my students aren't this good. 1) What is your favourite thing you like about Korea? 2) Where would you like to travel with your family? 3) What is your favourite food/What food do you hate? 4) What are some good qualities you look for in a friend? And to think that I've only had my advanced classes so far...just wait till I start my basic level tests - I'm sure there will be more to come. So lately, i've had the wonderful experience of listening to hoards of foreigners complain about working in Korea. I say that with complete sarcasm, because in all fact, i'm starting to get quite tired of hearing whiners complain. (a little background). A short little while ago, Korea experienced a pretty big scandal that captivated the country for quite a while. Basically, what appeared to be a small problem of a University professor having fake credentials (from a respected US school) turned into a national scandal when it was discovered that she was having an affair with a high-level (former) presidential-aide. (more details can be found here) Now, past that scandal, how is that connected to the foreigners whining and acting like little children? Good question - and here's the connection. This brought back to reality for Koreans the realization that its quite easy to forge education documents with some practice (an all too familiar issue with Koreans - see here for one example of many). As can be expected, Koreans have become somewhat skeptical of foreigners coming in and just teaching their children English. As a result, in the two and a half years I've lived here in Korea, I've been asked to verify my education certificates and degree four times; and I'm a certified Education teacher, with a degree in middle-school and high school English and History. To me, its a price you pay for making the big bucks in Korea (the average salary for teaching English in Korea is roughly 2million Won, or 2,125.00Cad - and that includes free housing and travel too and from Korea). My main frustration has been that when teachers generally are treated so well, they become accustomed to the royal treatment, that when something like this happens (provide verification of degree/graduation) they rebel and start screaming bloody-murder. One of the things that constantly surprises me is how much you can miss on the internet if you don't stop and smell the "roses", so to speak. I was recently stuck somewhere on the internet trying to find an article, and (thanks to google's oppressing ad's everywhere) I found an amazing website that allows you to order IKEA goods online from a (somewhat) English written online-shopping mall. I'll add a disclaimer that I've never ordered anything from the site, however, as foreigners cannot get a Korean credit card (not that I know of) this site is nice because you can pay by bank-transfer, which makes the payment very simple and instantaneous. Go ahead and enjoy. Use at your own discretion. The other thing that I really enjoy reading now is the wiki-page of Galbijim. I've found a host of different restaurants to try, many that are right in my neighbourhood, and I had no idea that they were there. Another reason that its quite nice is because its written by a host of people, so there's always something being updated, modified, or corrected. So if you're here, I'd encourage you to try it out.